Harnessing rain power has long been an important part of survival for the planet’s inhabitants. North American aboriginal tribes resorted to rain dances in an effort to coax more water from the skies, while other cultures crafted an intricate series of dams and aqueducts in an attempt to capture and hold onto whatever rain may fall. These rituals and manipulations – and the fact that stores today charge good money for bottles of water – are indicators of the value of water. But, unlike many other valuable commodities, water does fall from the sky and, depending on where you live, it may do so on a somewhat regular basis. So, instead of being over a barrel when it comes to water use, roll out the barrel instead. Most hardware, home renovation, and department stores sell rain barrels. You can also find them second-hand or consult your municipality about your rain barrel options. 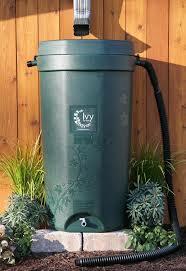 Many cities and towns sell rain barrels at discounted rates or offer incentives to homeowners who use them. The barrels are primarily fed by the eaves troughs that collect precipitation from your roof, so if you can’t easily place the barrel directly under a down spout, you may wish to purchase a flexible down spout attachment. The lid of the barrel should have a hole – or holes – to allow the water to get in, but openings should also be covered by a screen to prevent mosquitoes and debris from getting in. In addition, the barrel should have an overflow valve near the top and a threaded faucet near the bottom. Make sure the barrel is elevated so you can fit a watering can underneath. The obvious benefit of using a rain barrel is what it does to offset your water usage, which can increase as much as 30% during summer months. The use of rain water may reduce your water bill and the water itself may be better for your garden. Rain water from the roofs of houses generally contains very little contamination and it may be more beneficial to your garden soil than the hard water of your municipal system. Rain barrels also reduce demand on local water supplies and prevent some storm water runoff, which can pick up pollutants like sediment, oil, grease, and bacteria. The cost savings on your water bill is approximately 50 cents per filled barrel. It may not sound like much, but over the course of the year — depending on how much rain falls in your area — you could save over $100. Just a half inch of rain falling on a 1,000-square-foot roof will yield 300 gallons of water. To get an idea how much water the roof of your own house might yield, check out the Rainfall Harvest Calculator on the Gardener’s Supply Company website. I now live in Sidney, British Columbia on Vancouver Island and for 7 months of the year, we get a LOT of rain. I’ve used a rain barrel for years – but much to my surprise, when I moved here from Calgary, Alberta six years ago I discovered that although we get plenty of rain in the spring (or at least we used to – the past couple of springs have been very dry), there is actually very little rain in the summer months of July and August. So although I am able to use the water from my rain barrel to water some of my plants in the spring – by the time July rolls around, the water in my rain barrel is long gone with not much chance of getting refilled until October. To be honest, I use my rain barrel as a supplement to watering my plants and flowers with water from the tap – not an alternative. But I reckon every little bit helps. Whereas a friend of mine who lives in Calgary has two rain barrels set up and finds that the rainwater collected in those two barrels is actually enough to water the plants and trees (not grass) in her garden throughout the summer. Since it does still rain in the summer, the barrels get refilled. She’s got a great system going! If you use a rain barrel/s wherever you live, I would be interested in hearing about your experience. 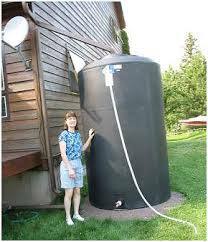 To find out more about harvesting rainwater in rain barrels, the CMHC (Canadian Mortgage & Housing Corporation) website has some great info. Rain barrels are great! Kevin went on-line and found out how to make his own. He used large plastic barrels and actually had 4 or 5 set up so the furthest one would fill first etc. until the last one was full. When he needed to move the water out of the barrels, he had a water pump he turned on to pull the water out. Here in the UK, we call them water butts. We have one in our garden and as your article says, they are simply brilliant. I use them mainly for the pots, with the watering can. After reading your article, I will try attaching the hose to it and water all the plants as well. Hi Nina! I didn’t realize rain barrels were called “Water Butts” in the UK – but it sure makes sense for you guys to have them because you get lots of rain.